I can't remember if I posted mine but even if I did, changed in the last year. 2011 Gibson ES 330 - love it even more than I thought I would - P90's are brilliant! I have only 2 Ricks now, the 325 C'58 and the 1991 360 I got when I was 20. I have a 52 re-issue Fender American Tele in butterscotch, a 1982 Ric 4003 in burgundy-glo, an Epi SG, a Fender Squire Strat in aqua, a Carlos roundback, a Cort headless bass w/Stienberger tuning, an Epi Viola and a Epi Casino in Sunburst all lefties. I have a pretty thin collection. 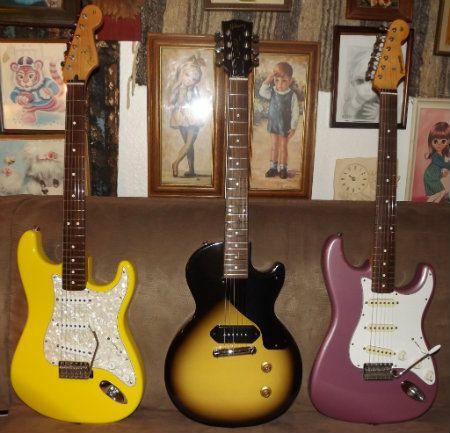 In electrics have my 650 Frisco, a sunburst 1990 Fender American Standard Strat, a cherry 1974 Les Paul Custom, a cherry Aria Pro Les Paul copy (youngest daughters), and a truly Frankenstein blond Strat ( youngest sons ). Currently have an opening for a Rick 12 string but that has to wait a couple more years till the youngest finishes grad school! And finally I am down to one bass, a brand new shiny black Hofner 500/1 "Beatle Bass"
Tacoma DM9 - 2007, around the time Fender bought the company, then shut it down. Made in Washington. Future guitars: Rickenbacker 620... I want a 610 too. Plus, I like the 400 models, and I wouldn't mind having my 2010 360 back... That would be nice. I have a new Telecaster, and recently reacquired my Squier Jagmaster. I'm giving my Jazzmaster to my father, who's currently working the best he can in SC. I'm making room for my 330. The Jazzmaster is gone; replaced by a '72 Tele Deluxe. My dad can't play guitar anymore because of surgery on his left hand. I don't have either of the Squiers anymore. 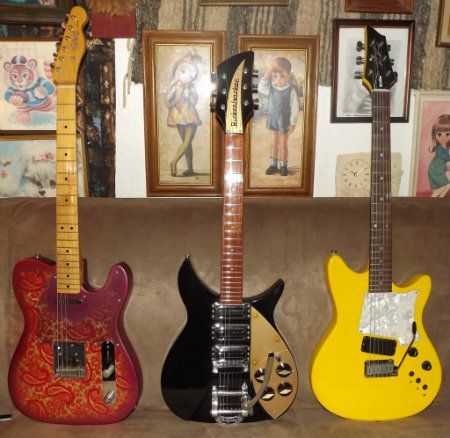 Tokai Breezysound,Fender Heartfield RR9,Fender Powerhouse strat,Gibson Billy Joe Junior and a Fernandes "The Revival"
Have been well off the Internet for awhile. New purchase brought me back! 1967 Jetglo 365 purchased and after some disappointment with moldy yucky surprise case, receiving a very dirty guitar and then my trusty shop denting the headstock and doing the worst set up ever, things are good and the new Ric is well! Splurged on a reissue vintage case since nothing leaves the house anymore and don't need more protection! Shes probably the reason i own my Rics especially the 650, she pointed it out. I lost my brother in 2010 to cancer. We played in many bands together. I miss him a TON. HE was the guitar player in the family. I am a piano/keyboard player. I ended up with all his guitars...(both strats, the yamaha and another 6 string accoustic takamine which i gave to my son...so, now i am carrying the guitar player torch for him..and I'm getting pretty good. Im not a religious man but i often feel he's helping me play ..I LOVE guitars..Music is like therapy for me...Huge Tom Petty fan here ..love there sound ..thus enter Rickenbacker! 3-Sound..again a matter of taste..and really what do i know ..im just a piano player that loves guitar, but i find fenders all have that "california-ish" surffy sound built right in , which rics are sort of equal too IMO. I traded my AFJ85 and Fender Hot Rod Deluxe for a Memphis Flying V (Seventies era; MIJ), and an incredible Kramer Baretta Special.